(I actually started this as a comment, but it got so long I created a separate post). I have a few thoughts about the accusation of reading our theology into the text. Carson, and many opponents of the “Grace” view I hold to, make 2 hermeneutical errors. First, they seem to lean too heavily upon Systematic Theology, and not enough on Exegetical Theology. Systematic Theology means to take knowledge of God from everywhere (i.e. Bible, Nature, Philosophy, etc.) and come up with a nice clean outline and a nice clean system. Open any Systematic Theology Book, and the table of contents reads pretty much the same. It starts with Theology Proper, then studies Bibliology (study of Revelation and the Bible), Angeology (study of Angels), and so forth. The problem is that most Theology books are written by one person, and are biased toward the view of the author, which unfortunately, is usually Reformed Theology. (Reformed Theology is the teaching of Augustine, Calvin and Luther during the Reformation, basically Infant Baptism, Amillennialism, 5 points of Calvin, the Decrees, etc., etc). Most Systematic Theology Books try to have lots of lists of verses to support the various points. They major on outlines and synthesis, rather than analysis of Scriptures. They spend almost NO time going through a careful study of the Scripture, so a lot of what they do can be called proof texting. Proof Texting is the practice of making a statement, and then giving a lists of verse references to support the statement, rather than taking the time to exegete or explain each text in context. Obviously it would take a long time to look up every verse in context. SOMEBODY HAS TO! Exegetical Theology (or sometimes called Biblical Theology) means that rather than ask “What slot in my Systematic Theology Book can I fit this reference into?” it asks, “What is the author of this verse, and passage trying to say?” In other words, we need to admit that we all “read our theology into the text.” The question is what theology are we “reading” into it? The difference is that when Zane and the rest of us in the “Grace” camp examine controversial passages on Salvation, Faith and Works, we try to take a fresh look at the Theology the author is presenting. Then we try to interpret the individual words and phrases in light of the AUTHOR’s theology and see if the meaning is more consistent and if it requires less “bending” of the text, than using the standard procedure of MAKING it fit into a traditional category. Just as a side note, I recommend Charles Ryrie’s book on “Biblical Theology of the NT,” and “OT Theology” and “NT Theology” by Roy B. Zuck to get started think about “Biblical” Theology. Of course once you get started, you won’t have to rely on books, but it does help to see what I am talking about here. Unfortunately, many well meaning Bible teachers seem to think that the study of “Theology” was somehow frozen in time at the time of the Protestant Reformation, and/or the Puritans, and that everything has to stand or fall before the teaching of these men. There were very intelligent men who wrote during this period, and we can learn from them. Hoewver, those of us who seriously believe in inductive study, should never stop there with their interpretations, and should be constantly growing and changing our Theology every time we open the Bible. Our study of the text (what I call inductive study) should lead us to constantly develop and correct our Biblical Theology when we study the text of Scripture at hand. Of course we need to keep in mind other clear Scriptures, so we do not contradict other passages. However, when studying passages about which there is a difference of opinion (i.e. Faith, Works and Salvation), the “Biblical” theology right our of the context, should trump tradition and Systematic theology. When you deal with texts about which Godly people have argued for centuries, you need to get out your pick and shovel, and do some careful, prayerful, Spirit led study on your own to make sure you don’t miss it too. James 2 is an excellent example of a passage which has been misunderstood for many years. They would say that we are “reducing” or “narrowing” the meaning of faith down. They would say we have to look at other scriptures, and also throw in some Aristotelian Philosophy (i.e. 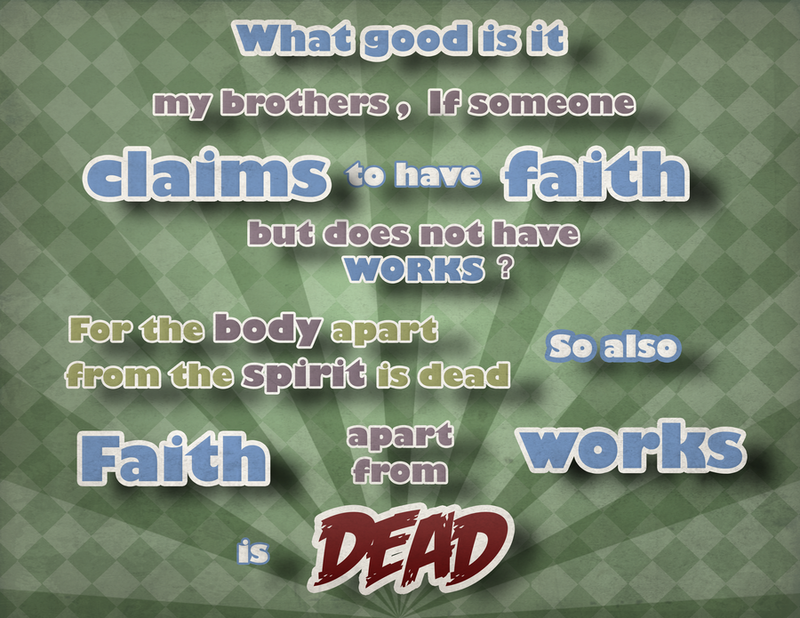 faith must have intellect, emotion will) to understand what John REALLY meant by believe. When I learned Hermeneutics at Moody, “reducing” or “narrowing” is precisely what we HAVE to do when we study a word in the context. Dr. Seymour (President of Frontier School of the Bible) says, “We need to use Biblical words, in context, with Biblical meanings and Biblical definitions.” We need to study the text to REDUCE the meaning to the one the author intended. To “expand” the meaning beyond the single intent of the author, or to try and come up with some sort of kitchen sink approach with multiple meanings which is the same in all texts, is a denial of authorial intent. There is no valid reason to violate the plain meaning of the text in John 3:16,17. It is also a violation of common sense to see John 3:16,17 as being complicated or difficult to understand. John 3:16,17 are clearly a “chair” passage which can be used to help us understand EXACTLY what we have to do to get everlasting life. To make it more complicated is to abuse the principle of “chair” passages. (See the volume by Kaiser and Silva “Introduction to Biblical Hermeneutics,” chapter 15, where I got the phrase “chair passages” from). Wouldn’t it make more sense to interpret the most difficult passage in the Bible (James 2), in light of the most easy passage of the Bible (John 3:16), rather than the other way around? Again, the decision of which passages are clear passages, requires a person to be able to know the difference between clear and unclear passages. I am not sure it is that difficult of a concept to grasp. I would read John 3:16,17 to a 5 year old, and they will probably give you the plain meaning there. Of course they would need a little explanation, like who Jesus was, and that He came and lived a sinless life, and died on the cross to pay the penalty for OUR sins (themselves included. I think they also would need it explained to them, that everlasting life is God’s kind of life, and without it we will go to hell when we die. I would then ask them, “what does this verse say we need in order to get God’s kind of life – everlasting life?” I think most kids would get it. “Believe in Jesus for it.” I would say John 3:16,17 is a “clear” passages. An “unclear” passage is one that a 5 year old may have problems with, which produces more debate, and seems at first glance to contradict other more clear passages. For example, Paul taught that we are justified by faith alone, and faith is not compatible at all with works (Rom 4:5), and John 3:16,17 states clearly that we are saved by faith alone. 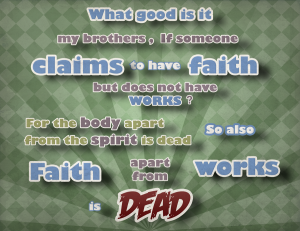 Now when we are told “a man is justified by works” (James 2:24) , then doesn’t it make sense that we should be open to the possibility that James in his context is talking about something DIFFERENT about faith, works, death and justification than Paul or John is? I think it is obvious James 2:24 is an unclear passage. I know this post may seem complicated, and I apologize for that. The bottom line is that I believe that God is not trying to hide provisos, or unexpressed stipulations, in the text when it comes to things like knowing exactly what we need to do to get to heaven when we die. I don’t think God is trying to play games with us in the Gospel of John. The fact that the Bible is not some sort of puzzle, which can only be interpreted by some elite group of people, is known in Theological circles as “The Perspicuity of Scripture.” In other words, the plain literal meaning of the text, as understood in context, should be preeminent. I am not encouraging that we should jump through the Bible and make all sorts of shocking discoveries that basically tick people off at us. I am talking about careful, and prayerful, Spirit led consideration of texts like James 2 and John 3. We need to be confident that John 3:16,17 really is a clear “chair” passage, and that John is crystal clear, and is NOT telling us a lie. As the two videos posted here teach, I think Justification Salvation in Romans, is DIFFERENT than the Sanctification Salvation in James. When you finally see it, you will probably hit yourself in the head and ask, “Why didn’t I see that? ?” The problem is caused by having blinders on, and NOT letting the passage define the meaning of terms. It is much easier to have other teachers and preachers, and books define the terms for us, rather than actually looking at the text itself. We need to learn how to study the Bible for ourselves, and not be hopelessly dependent upon others to pre-digest it for us. I could go on, and on, but I will stop here. If anyone else has any comments on this, please let me know.